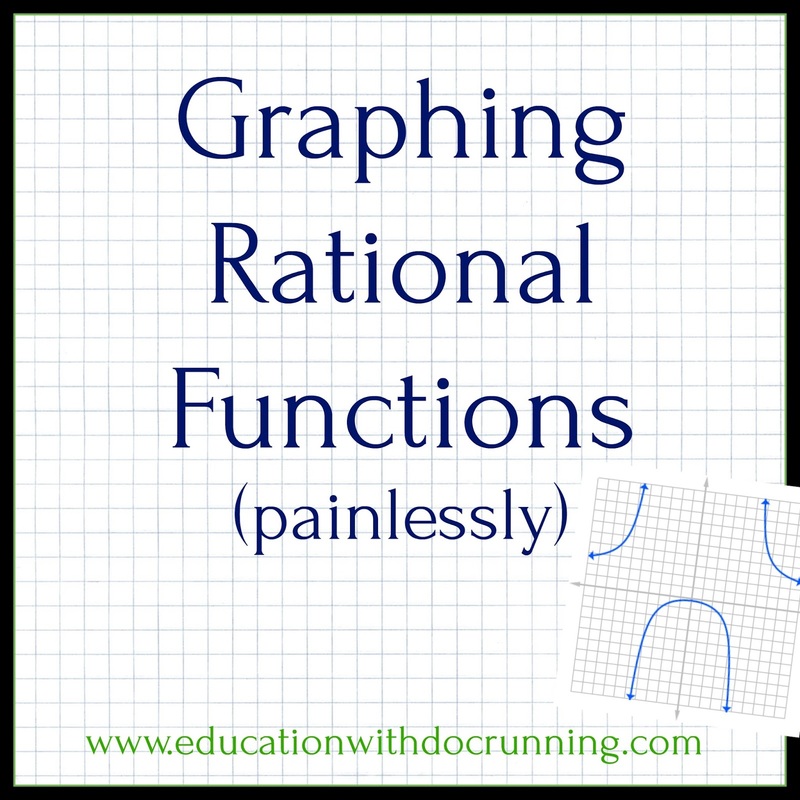 Graphing rational functions is dull and can seem superfluous given the wealth of online calculators that not only show the graph but also list the information one needs such as maximin and minimum. So when I teach graphing rational functions to my PreCalculus students I aim for three student outcomes: a solid understanding of what the information means, how to apply the outcomes and an ability to roughly sketch a rough graph. The last requirement I think of as the double check...does the output make sense. We should be able to tell if an answer is logical. The calculator might not make the mistake but we may in setting up what we input into the calculator. Students should be able to look at a graph and say "mmm...that doesn't look right." The best explanation I've seen for how to graph rational functions is from cool math. The neighborhood explanation is a concrete example for students. (Math is Fun has a pretty good explanation as well). Students complete color-coded notes in graphic organizers that I designed specifically to accompany the Cool Math explanation. The color helps with they asymptotes and zeros significantly. I have students work in partners to practice graphing functions by hand. This is where they really test how well they can complete a rough sketch of the graph. By 4 or 5, they have a good idea of what makes sense from an equation. 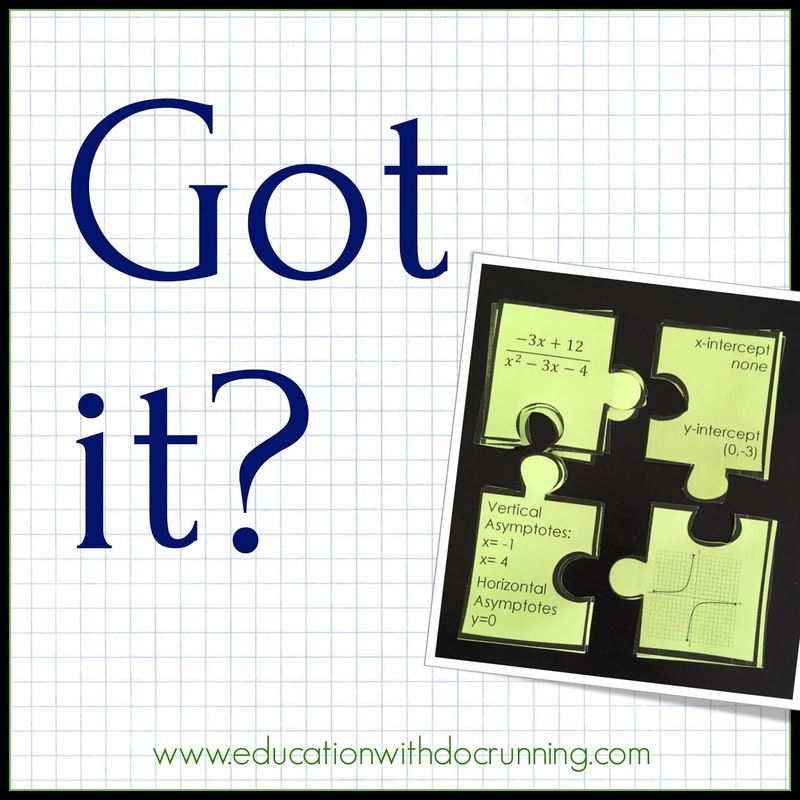 To see how well we understand what makes sense and the outcomes, we complete four-part puzzles. I like to do this in partners or small groups, but we have also used it for homework. Often it just depends on the class as to how/where we do the puzzles. 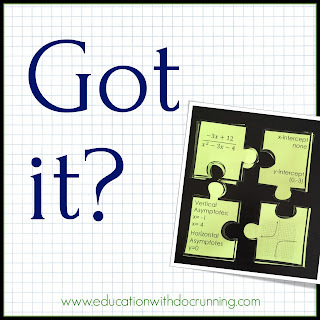 The puzzles are self-checking in that you can't complete all 8 unless every aspect is right in each so students can catch their own errors. I love empowering them to take charge of their learning. 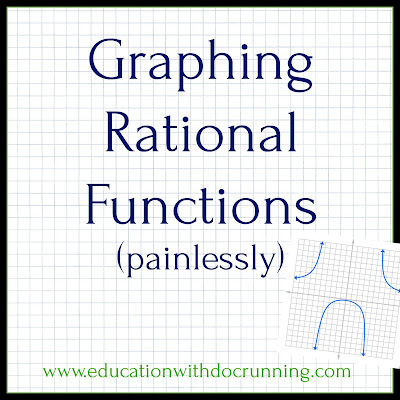 Finally, we look at some applications of rational functions. This video from Math Dealers has some fun applications. We watch the whole video (it's short). 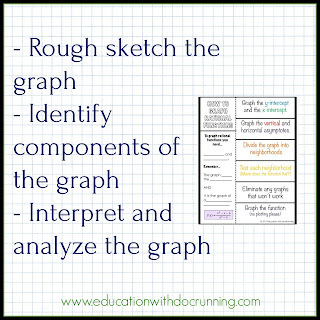 The beginning reviews graphing and defining rational functions and the second part shows the applications. We interpret graphs and write about what they are telling us. We write functions and interpretations of graphs. 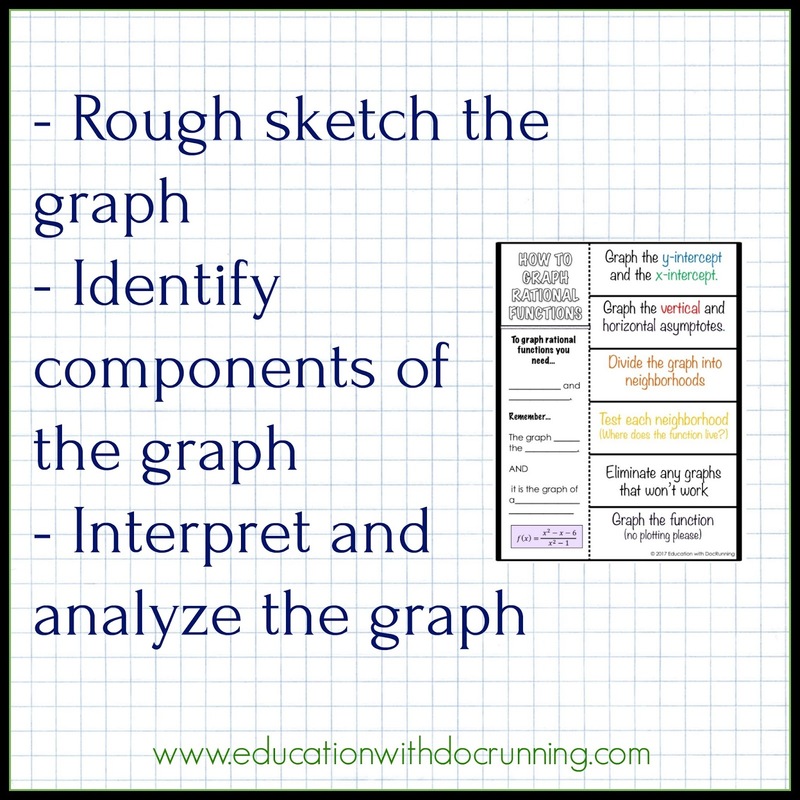 Students can generate the story as long as it fits the graph. 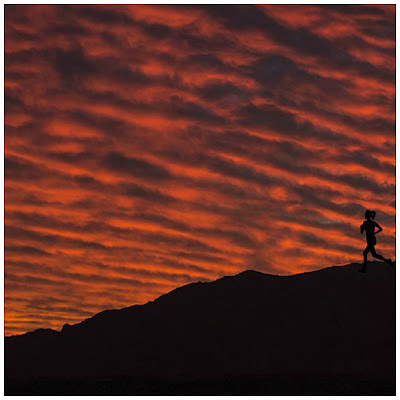 Perhaps a graphs hows energy usage in a household or information about travel speeds on a trip or changes in the concentration of a drug in blood over time. 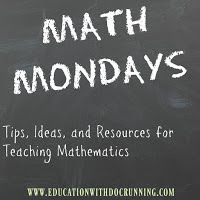 Math Mondays is a bi-weekly blog post (2nd and 4th Monday of each month) sharing tips, ideas, resources, and products for teaching math. If you have questions or think there is something I should include, you can leave me a message in the comments section below or at the store in the question and answer section.